Nine: Flame's Edge — The Old Town Alchemy Co.
New drinks are weird, intangible things. Sometimes, they can be engineered. Sometimes, they come from little more than an instinct. And sometimes, they just happen. We've been hosting cocktail masterclasses at work for a while now. They've proven to be popular with birthday and hen parties, possibly because it provides a decent excuse for exposing the guest of honour to phenomenal amounts of alcohol. There's a standard format for the session - a champagne cocktail of some description on arrival, followed by a demo of the different ways of making cocktails before getting each member of the group to make their own drink. Depending on the size of the group and how much time we have, I sometimes try to mix up a couple of drinks based on suggestions from the group. Most of the time, it's pretty easy to come up with something that ticks all the boxes. Every once in a while, though, it's a bit tougher. On Saturday night, they wanted fire. The problem was that I had totally run out of overproof rum, removing the easy option for fuel. So, I decided to go for Jamie Boudreau's Rubicon - only to discover that the kitchen was out of rosemary. The burning Chartreuse also has the benefit of cooking the rosemary, releasing a lot of aroma and allowing the flavors to better permeate the beverage as oils are released. As for the “wow” factor, when you extinguish the flame with the rest of the ingredients, a thick white smoke develops. I'm pretty certain blue flames come under "wow", too. So, taking the Rubicon as a starting point (after all, there's no going back from this point), here's what we ended up with. Strip three long strips of peel from the orange with a channel knife. Place two of the strips in a rocks glass with the Chartreuse, keeping one aside for garnish. Pour the whisky, lemon juice and Creme de Cacao into a shaker, add ice and prepare to shake. Before you do, light the Chartreuse in the glass with orange zests. Shake the remaining ingredients and strain into the glass, extinguishing the flame. 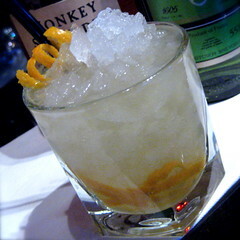 Fill the glass with crushed ice and garnish with the remaining orange zest twist. Posted on March 3, 2009 by Jon and filed under Fiftytwo, Mixology, Projects, Recipes and tagged Chartreuse cocktails Creme De Cacao molecular mixology whisky.